Dura-Lar is the acetate alternative. It combines the best features of Mylar® and acetate, and offers a variety of products so that you can purchase the film that suits your needs precisely. It is always consistent in color and overall clarity, and won't discolor with age. 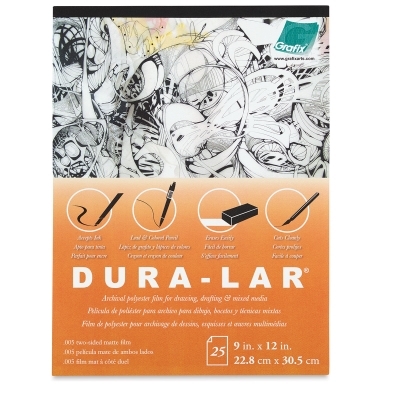 Dura-Lar is archival quality, safe for overlaying artwork, and it lays flat. It will remain dimensionally stable for as long as you need. Dura-Lar Matte — Both sides have a matte surface which accepts ink without feathering, as well as pencils and other drawing media. The surface is erasable. Its thickness is .005" (.127 mm), medium weight.